Eating meals together was a way of life when I was growing up. In our small town there were limited options for dining out and definitely no fast food restaurants. My mother was a wonderful cook so we all enjoyed sitting down together – it never occurred to us not to be there. In the last few years, the availability of fast foods and super busy lifestyles played a part in the demise of family meals. However, with an increase in obesity, the farm to table movement and expert advice about healthy eating, many individuals are reevaluating our eating habits. I’m excited to hear that more young families have made a conscious decision to limit extracurricular activities in favor of more family time at home. Part of that plan includes cooking and eating together. Home cooking does not have to be a chore! There is so much information available about how to create quick, healthy meals for your family. Planning is an important part of the equation to help eliminate the anxiety & stress of preparing meals at home. Trying to decide what’s for supper on a day-to-day basis will eventually wear you down and will likely result in a trip to fast food. Get the entire family involved in planning and cooking so that it becomes part of your quality time together. 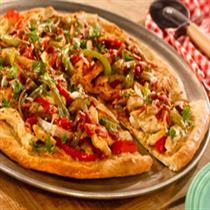 Smokey Chicken Fajita Pizza is kid friendly recipe the entire family will love. The topping can be prepared in advance, if time is short at night. Celebrating Christmas Eve is usually entrenched in family tradition and seems to vary more than the holiday meal the next day. When my siblings and I were young and still at home, we gathered around the Christmas tree and exchanged presents on Christmas Eve. I remember this being a wonderful, magical time as we enjoyed the warmth of family love and excitement of a fast approaching visit from Santa. We usually ended the evening gathered around the piano singing Christmas carols, accompanied by my sister, our resident musician. Christmas Eve supper was nothing fancy, but merely a casual family meal. Mother kept this meal simple by preparing a pot of homemade vegetable soup and cornbread in anticipation of our big Christmas dinner the next day. As time moves forward, my holiday traditions have evolved to include new in-laws and a new generation of extended family. Many folks attend a church service, go caroling, watch a favorite movie, make cookies for Santa or volunteer to feed the homeless. Others enjoy a festive holiday party with friends. For a warm relaxing Christmas Eve, a good friend of mine has begun a family tradition of giving new Christmas PJ’s which are to be donned for the evening. If your Christmas Eve is a casual “at home” family affair, you might like to follow my mother’s lead with a hearty soup, stew or main dish. Try warm, comforting Turkey and Smoked Sausage Stew with Corn Meal Sage Dumplings, Creamed Chicken on Corn Meal Waffles or Tuscan White bean Soup with Hot Water Hoecakes to calm the Christmas Eve excitement. What is it about a brunch that always sounds so appealing? Is it that it falls at a convenient time of the day, our love for breakfast foods or the camaraderie of family and friends? Whatever the reason, brunch is a great way to celebrate the holiday season. The menu is easy to plan if you start with hearty main dish cobbler. Dessert cobblers are certainly a Southern favorite, but the same concept will work for savory dishes, too. Breakfast cobblers are made with an easy pour-batter crust. Combine self-rising flour, butter, milk and eggs and then pour over a filling. As it bakes, the crust becomes crisp on the top and the eggs in the batter create a quiche-like texture on the inside. It’s hard to beat the taste of a traditional country breakfast consisting of ham, eggs and hash browns. Country Breakfast Cobbler combines all these favorites with cheddar cheese in one easy dish with a tender crust. A more sophisticated version is the Italian Breakfast Cobbler which is also delicious. This cobbler combines savory Italian sausage, spinach, sweet red pepper, onion, mushrooms and provolone cheese with a Parmesan cheese topping. Either of the above cobblers could be considered a meal in itself, but with the addition of seasonal fruit, a crisp green salad and something sweet – you have created the perfect brunch menu. We spend a lot of time planning the perfect holiday dinner, but often forget about all our other meal responsibilities during the holiday season. If you’re having a gathering at home with family or friends during the holidays, you’ll need to give some thought to what you want to serve. Something hearty and simple is a good place to start when planning your menu, including being able to prepare at least part of the recipe in advance. This Country Italian Sausage Pie recipe is heartwarming and satisfying. The classic combination of sausage, peppers and onions is always a crowd pleaser. The filling may be prepared early and refrigerated or frozen for later use. To complete the recipe, heat the filling in a skillet and top it with the cornbread batter (if the filling is frozen, thaw in advance). This recipe goes well with a green salad topped with vinaigrette dressing. Creamy Chicken ‘n Veggies with Black Pepper Biscuits recipe is comforting like those chicken pies your grandmother made. This filling may be made in advance. Ensure the filling is hot before dropping the biscuits on top. A fruit salad or a green salad with fruit is a good accompaniment to this recipe. Maybe one made with pears or apples, blue cheese and toasted or glazed walnuts! Put a “convenience twist” on your meal by serving store-bought barbecue on homemade corncakes. Top the corncakes with a slaw of your choice and you’re ready to go! There’s no shame in adding baked beans for a traditional side to this delicious, convenient sandwich. It’s time to “fall” back into a routine with the help of fun, easy breakfast treat recipes. Start the process by planning a few easy menus and stocking up on basic items that will help you be successful. You’ll be amazed at how pre-planning can ease or even eliminate your morning chaos. It’s always handy to have several different flavors of Martha White® Muffin Mixes on hand. You can have warm muffins fresh out of the oven in less than 20 minutes or use the mix as a shortcut for delicious pancakes, waffles and other breakfast goodies. I especially like the muffin mixes you can combine with other ingredients to balance out the menu like these Martha White® Blueberry Pancake Roll-Ups. The thin egg-rich batter makes a thin pliable pancake that can be rolled or folded. We’ve suggested blueberry pancakes, filled with lemon or vanilla yogurt, granola, nuts and berries. Don’t be afraid to mix and match flavors and fillings to suit your family’s taste. In the essence of time, pancakes can be made in advance and frozen. Before placing in the freezer, layer each pancake with waxed paper and put them in a plastic storage bag. The Rise and Shine Banana Berry Parfait recipe is made with muffins (crumbled), yogurt and fruit. This makes breakfast time fun for the whole family. With a little planning, you’ll be able to whip up a breakfast that will have your family up and out of bed in a flash – and still have time to sit down to breakfast together. Over the years I’ve learned some strategies to avoid cooking in a hot kitchen on a summer evening. Shopping once a week forces you to have meals planned in advance. Eliminating that last minute rush to the grocery store goes a long way in keeping the cook cool. Save time by grilling meats like chicken breasts, bratwurst, ribs and pork tenderloin, as well as vegetables over the weekend to use during the week. Corn in the shucks and roasted red pepper are especially good grilled. I put anything that won’t be eaten until the end of the week in the freezer. Another tip is to cook peas, green beans or corn off the cob and refrigerate or freeze for later use as well. The grilled chicken can be used to make chicken salad – we love it with pineapple chunks and toasted walnuts. I often slice the warm chicken breast, bratwurst or tenderloin to serve with the cooked vegetables the first night. Later in the week, a green salad with chicken, roasted corn kernels, avocado and roasted red peppers is delicious. Another strategy to help keep your kitchen cool is to avoid using the oven. For an old fashioned vegetable supper, peas, beans, and corn can be warmed in the microwave. No vegetable supper is complete without cornbread. Try this Martha White® Sweet Milk Corn Cake recipe and top dinner off with a delicious slice of Martha White White Chocolate Raspberry Pie.